Bill Monroe was born William Smith Monroe on 13 September, 1911, near Rosine, Kentucky. When working at an oilrefinery in Indiana in 1929, Monroe gained local fame with his brother Charlie, as The Monroe Brothers, eventually recording some 60 numbers for the Bluebird label between 1936 and 1938. The brothers disbanded in 1938 and Bill went on to form the Blue Grass Boys and gain a place on the Grand Ole Opry. By the end of 1945, the band included such names as Earl Scruggs and Lester Flatt. 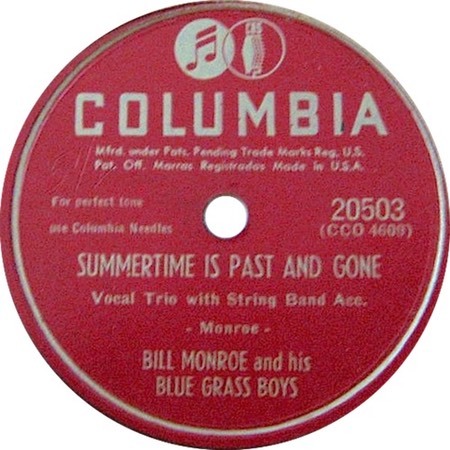 Between 1946 and 1947, Monroe and his Blue Grass Boys recorded 28 songs for Columbia Records, including the original versions of "Summertime Is Past And Gone" and "Blue Moon Of Kentucky." After the breakup of this "original Bluegrass band," Monroe moved to Decca and formed another Blue Grass Boys lineup, yet again garnering extraordinary success. Elvis imitated Monroe's delivery during the so-called "Million Dollar Quartet" session. The number is also listed as "Summertime Is Past and Gone." Bill Monroe died on 9 September, 1996.